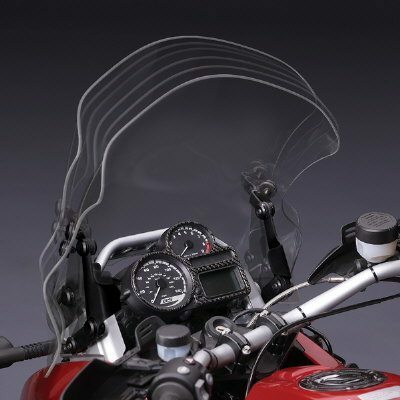 BMW R1200GS Windshield A rake adjustable Clear -Z2243BMW R1200GS Windshield from Ztechnik Take rake adjustment one step further. comes with full mounts and fittings plus unbreakable lexan screen , unique vstream principle allows less buffeting fpor rioder and pillion and higher touring speeds with adjustability , made from Lexan polycarbonate not usual cheap weak perspex/acrylic!! these screens are bulletproof- see our video for proof!Adjust windshield rake on the fly, without tools, up to 3.2in. Use stock BMW mount points.